The product features favorable anti-humidity, anti-salt spray, anti-brine and water replacement performance. It possesses fine antirust property to ferrous metals and non-ferrous metals. 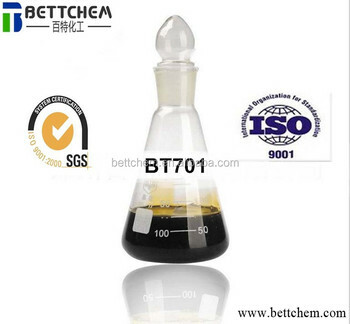 It shows good oil solubility after heated, and it can adsorb on the surface of metal to form a protective film, which can protect the metal from the corrosion and rusts. The product is primarily used in antirust oils such as replacement-type anti-rust oils, inter-process rust oils, seal oils, lubricant & anti-rust dual-use oils, and anti-rust greases etc. The recommended dosage is from 3% to 15%. It is packed in 25 liter metal drums. The storage, transport and production should meet the requirements of SH/T0164. The maximum temperature should not exceed 75°C, for long-term storage, the maximum temperature should not exceed 45°C. The product is not flammable, explosive, and corrosive. Its safety cause, environmental protection and usage may refer to the general procedures for the common petroleum products. The supplier is ranked number 8 by reviews data in Petrochemical Products.